New Training Centre for Southampton Airport. Branding by Glow. 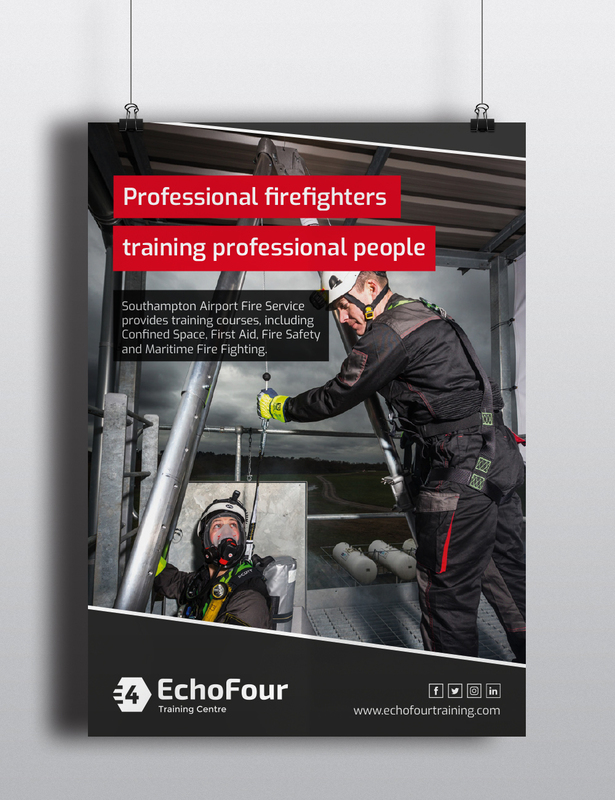 IN THE STUDIO THIS WEEK: SOUTHAMPTON AIRPORT’S NEW TRAINING CENTRE – ECHOFOUR! #InTheStudioThisWeek: The great team at Southampton Airport has been working with Glow to promote its exciting new training centre, called EchoFour. Set with the backdrop of Southampton Airport’s runway, EchoFour Training Centre provides businesses from across the region an opportunity to learn and develop in a unique environment. Courses include Confined Space and First Aid plus Fire Safety and Maritime Fire Fighting; all delivered by serving fire fighters. Glow was approached by Southampton Airport to create the logo and brand identity, as well as promotional merchandise, posters and social media headers. One of the key objectives of the brand was to push a vibrant red. The inspiration for the tone came from Cadbury’s Cream Egg and the car in the film ‘Cars’! At Glow we’ve been working with Southampton Airport for many years and we have had the pleasure of working on some fantastic design & digital projects and creative campaigns. So much so we have put together a showcase of our best bits – http://www.theglowstudio.com/portfolios/sou/ – we hope you enjoy!